AFC Fylde played out their first goalless draw in the National League in a tight encounter against Gateshead. Despite dominating for long spells, the Coasters failed to make a breakthrough for the first time this season and were given a huge let-off when Paddy McLaughlan fired a second-half penalty wide. Manager Dave Challinor made two enforced changes with suspended duo Andy Bond and Lewis Montrose making way for Jordan Richards and Sam Finley. New man Jason Taylor, signed on the morning of the game, was named on the bench. 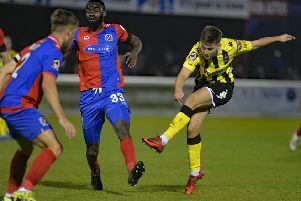 Saturday’s two-goal hero Danny Rowe was looking understandably confident under the floodlights at Mill Farm and saw a vicious strike from 18 yards deflected wide inside three minutes. The Coasters were controlling in the early stages and the expectant crowd fell silent as Rowe lined up for a free-kick 25 yards from goal, however the forward powered his strike into the wall and Finley could only fire over on the follow up. A wayward effort from Danny Johnson was the only chance of note for the visitors early on as they soaked up the home pressure. Wes York was played in soon after but Jay Lynch was happy to watch the midfielder’s dragged shot roll wide of the far post. The home crowd held their breath once more as free-kick specialist Rowe stood over the ball from another promising position however this time his curled effort flew narrowly over the bar. All the goalmouth action was in the visitors’ penalty area and Rowe’s shot on the turn was well saved after he was picked out in the centre from Hardy’s touch back. The match was lacking life as the half-time whistle approached – a speculative long-range drive from Gateshead’s Luke Hannant the only chance of note. Fylde were a whisker away from opening the scoring shortly after the restart when James Hardy slipped Smith clean through and although the nippy winger rounded the goalkeeper, his eventual effort was cleared off the line by Jamal Fyfield. Neither side had really settled into any rhythm with real chances few and far between as the half wore on. Finley teed himself up on the edge of the area with an hour gone however his fierce attempt was well over the bar. However, all of a sudden, the match sprang to life when the visitors were awarded a penalty. Tunnicliffe was adjudged to have impeded Neill Byrne as a cross came in from the right, however Paddy McLaughlan whipped his spot-kick wide of the right-hand post. Gateshead frontman Jordan Burrow had a glorious chance to finally unlock the Fylde defence when he was picked out by Scott Barrow although Lynch had other ideas and made light work of his goalbound strike with a stunning save. Jack Muldoon was causing problems after his introduction and only a strong block from stopper James Montgomery denied the forward after he had burst down the left. Seemingly not content with a point, Rowe looked desperate to add to his goal tally and win it for the Coasters and tested Montgomery with a long range strike after twisting and turning 30 yards out. The evening was summed up as Rowe stood over another threatening free-kick only to knock the ball tamely wide as both sides shared the spoils. AFC Fylde: Lynch, Richards, Burke, Tunnicliffe, Grand, Francis-Angol, McCready, Finley (Blinkhorn 87), Hardy (Muldoon 54), Smith (Jones 66), Rowe; not used: J Taylor, Ezewele. Gateshead: Montgomery, Vassal, Barrow, Byrne, Fyfield, York, Hannant, Burrow, McLaughlan, Williams, Johnson (Preston 46); not used: O’Donnell, Maxwell, Penn, Handford.